Maybe it's a sign that I'm getting old, but lately I've been trying to work out ways of using technology less. I know that probably sounds odd, especially as you're reading this on the internet, using some sort of computer, smart phone or tablet, but it's true. When I was growing up in the 80's, everything was about the future. We had the Space Shuttle, Star Wars, Back to the Future, and the dawn of the computer game era. Back then, and indeed much into my teens and twenties, I've always been into the new thing. I've got no end of Apple products, I have a smart tv, and blu-ray. Everything you'd expect to find in a 'man pad'. But as much as I love some of the things we have available to us today, I do feel that things are getting a bit too much, to the detriment of our nature as human brings and individuals. If you follow me on twitter, you'll probably notice that I've currently got about 45000 tweets under my belt. That's quite a lot, and even I'm not entirely sure how I managed to clock up that many, but things like twitter and facebook can be extremely easy distractions. They're always there. My phone often chirps up at me at random points inviting me to stop whatever I'm doing and waste time on the often less important. Having recently sat on a plane for nearly 11 hours without that constant social media temptation there, I've actually found myself somewhat liberated. Don't get me wrong, this isn't a rant about how we should renounce all technology, far from it! Technology rules! Social media is awesome! I do, however, think there are certain things that have suffered significantly in recent years though. Number 1 on my list has got to be my handwriting. There was a time when I had quite nice handwriting. Okay, so it wasn't overly Dickensian, with flourishes and calligraphic accents, but it was far from scruffy. Well because everything's electronic nowadays, I hardly ever write. The net result of which is that my handwriting has suffered. But not everything needs to be electronic! I'm a big fan of postcards from around the world. No one sends them anymore, but how awesome is it to receive something in the post from a friend on the other side of the world? People definitely need to send more postcards! Next, instead of emailing people to say thank you, why not just send a hand written note? Isn't that far more personal? We often pay a premium for things these days because they say 'handmade'. So many of the luxury brands and products pride themselves on the way that everything they do was crafted using human hands, and not mindless machines. As a photographer, I often hear others harping on about how it's the person behind the camera that creates the photograph. It's ourselves, and our individuality that separates us, and yet in the modern digital age that craves speed, it's often at the expense of that individuality. There's also something far more organic about putting pen to paper when trying to generate ideas. It's far more fluid, and often quicker to get the ideas out. Anyway, with all this in mind, I went out and got myself a new fountain pen today. There's a couple of reasons for this. Firstly, before getting on my flight to San Francisco before Christmas, I was killing time in the airport terminal and happened to wander into Mont Blanc. They had some truly beautiful pens, all completely out of my price bracket, but it started a mini obsession. The second reason, is that when I was at school, we started learning to write with a pencil, because you could rub out mistakes, then once your spelling was good enough, you would move onto using a fountain pen. Biros and ballpoint pens weren't allowed. It had to be a fountain pen! So I figure if I want to learn how to write nicely again, go back to basics and the way I learned as a child. 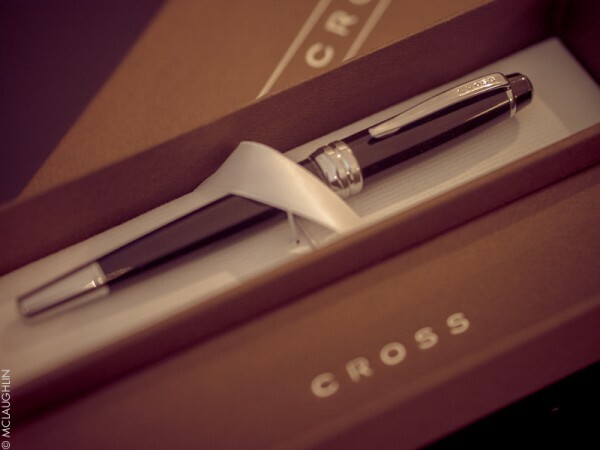 The pen I went for was the relatively inexpensive 'Bailey' from Cross, which I bought from The Pen Shop in Liverpool Street Station. 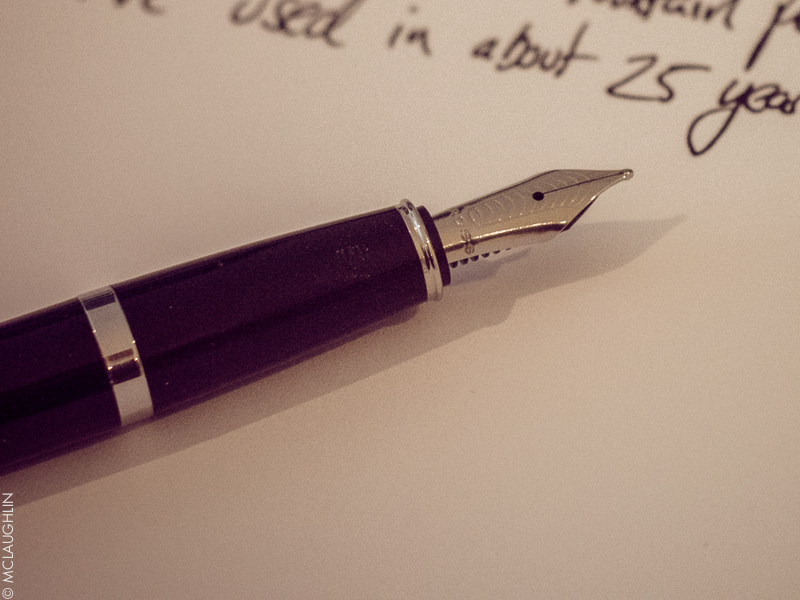 I didn't want to break the bank - this is the first fountain pen I've used in around 25 years! I need time to prove that I'm worth a Mont Blanc. Along with the pen, I also got some ink cartridges, and then popped into Snap Store in East London to get a couple of notebooks. I bought 2... The first is a simple ruled notebook, so I can practice my handwriting - yes I really am going to do this! The second, is a small plain book that I plan to use as a scrap and ideas book. 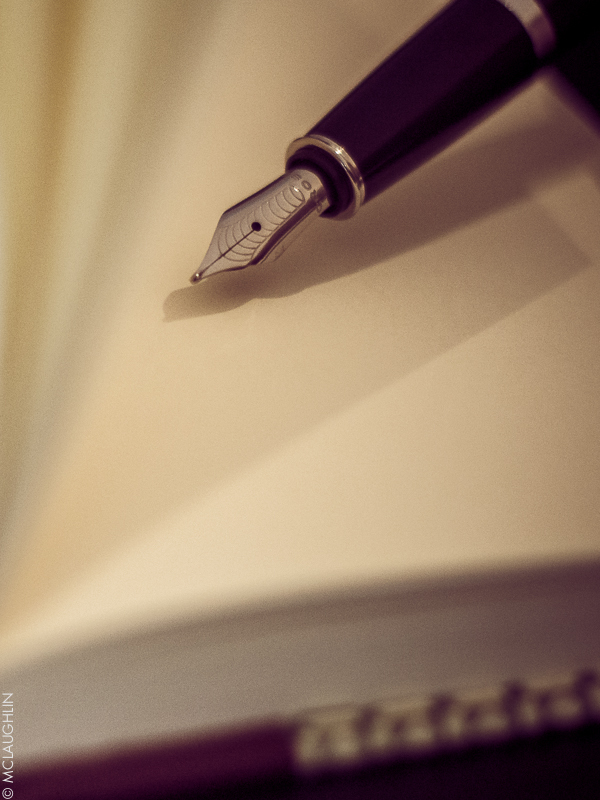 I want to jot down ideas, stick in things I've seen or things that inspire me. This will help my creativity and my work. Of course I'm still a techno junkie, and love some of my creature comforts, but I've learned that it can all get a bit much, and sometimes it's important to switch off the electronics, and strip back to the bare essentials. Only then can the ideas and creativity really flow.